Consistent with the findings and recommendations of the Global Commission on HIV and the Law, and in line with the aspirations articulated in his synthesis report on the post-2015 development agenda, the United Nations Secretary-General Ban Ki-moon is convening a High-Level Panel on Access to Medicines. The overall proposed scope of the High-Level Panel will be “to review and assess proposals and recommend solutions for remedying the policy incoherence between the justifiable rights of inventors, international human rights law, trade rules and public health in the context of health technologies.” Secretary-General Ban Ki-moon has asked UNDP, in collaboration with UNAIDS, to serve as the Secretariat for the High-Level Panel. 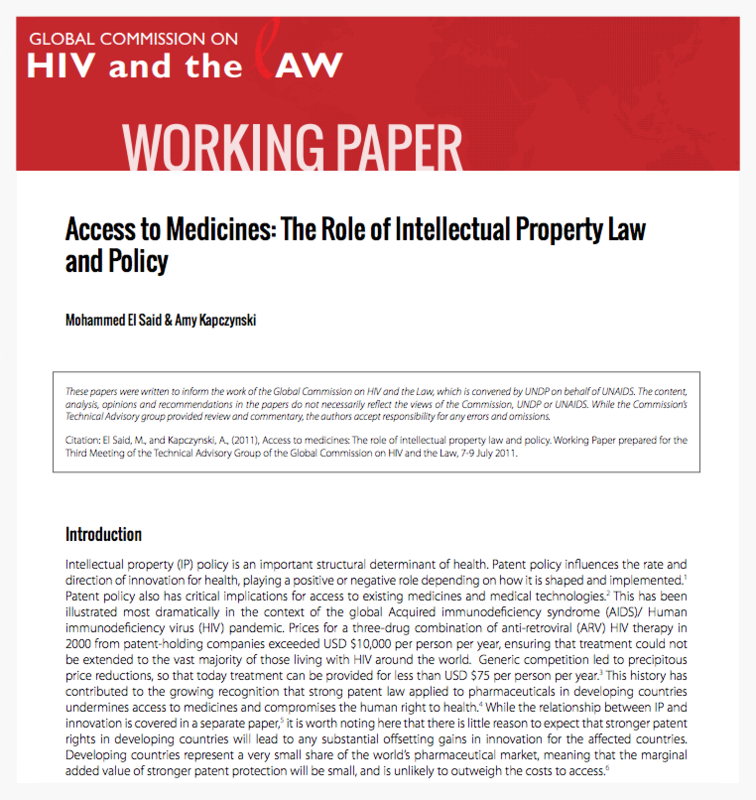 The work is based on three mutually reinforcing pathways – a High-Level Panel that will solicit and assess proposals and recommend solutions to address the policy incoherence between the justifiable rights of inventors, international human rights law, trade rules and public health in the context of health technologies; an Expert Advisory Group to provide technical support to the High-Level Panel, and a process of consultation which will include two public hearings convened by the High-Level Panel to interrogate shortlisted proposals with a diverse range of stakeholders. The High-Level Panel is comprised of eminent and respected individuals from diverse stakeholder groups acting in their individual capacities. They bring expert knowledge and understanding of the broad range of trade, public health, human rights and legal issues associated with innovation of, and access to health technologies. An Expert Advisory Group will be constituted to provide technical insight and advice as requested by the High-Level Panel. Facilitated by the Secretariat, the Expert Advisory Group will support the High-Level Panel on key elements concerning the undertaking of its work. The Expert Advisory Group will include individuals with expertise and experience on matters including human rights, trade, innovation and public health as well as senior technical staff from relevant multilateral organizations whose mandates intersect with the work of the High-Level Panel. The High-Level Panel will issue a call for proposals, based on objective criteria, for ways in which the misalignment between the right to health and trade rules can be best addressed. On the basis of proposals received, the High-Level Panel will hold hearings and, where appropriate, facilitate dialogues involving relevant stakeholders – including technical experts, patient groups, civil society, governments and industry – to review and assess shortlisted proposals. The High-Level Panel will hold two public hearings to interrogate and discuss shortlisted proposals. The Expert Advisory Group will be invited to participate in both public hearings. The key outcome of the High-Level Panel’s work will be an evidence-informed, rights-based analysis of proposals and recommendations to promote the development and production of health technologies in a way that balances trade, human rights and public health. The recommendations will be anchored in the Sustainable Development Agenda’s aspiration to leave no one behind. The Secretary-General will make the report available to the General Assembly and undertake further action as appropriate.